This was one of the new churches erected under the Act of 1711. It was built to serve the fashionable new residential area of Hanover Square. 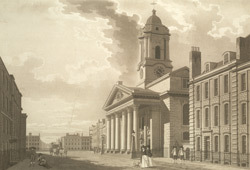 Its portico was the first to be built for a London church. The church was a popular place for weddings, including those of Lady Hamilton in 1791, PB Shelley in 1814, Disraeli in 1839.